I don't have any direct contact to Serghey, just beeing a mod here :-). But I know that he was contacted multiple times, but - as far as I know - he didn't respond. No promise - personally I don't want that vesta will die! I just checked the other control panel on the market and have to say, that vesta is the only one i want to use. Completely agree SCiT. 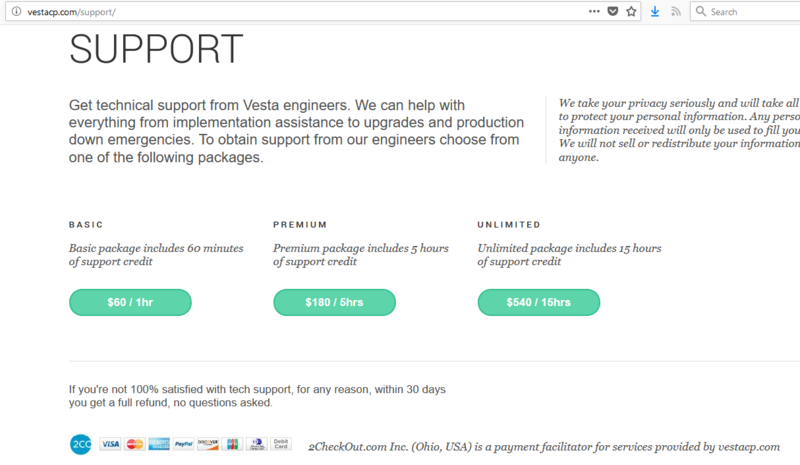 VestaCP has no reliable alternatives. Unfortunately I am not a developer myself. I can make minor changes/modifications but that's it. by the way: Also we tried to contact ctrlpac (thread opener), but he didnt respond to a pn from mehargags. Maybe he can try to contact me if he still has interrests to support vesta. Same here, and that's the problem we've right now - we can't find enough devs :-). I hope the best for vesta and also try to do the best to keep it alive. a) Rely on the community to find the exploited vulnerability and then fork VestaCP into something else. b) Make a fund to offer a prize for whoever finds the hole, and then fork VestaCP. d) Rely on the core dev team. Meaning no ETA no info until they want. Let's say we managed to find the hole.. After what? We need a team of devs (and a lead dev) to continue the project. And it seems difficult to do so (at least so far). 2) Apart from reward to the support team admins, the earned money can help us hire professional security consultants who can find vulnerabilities and polish VestaCP code further. 3) And ofcourse, include more developers in the team to speed up development. However, I don't know why this is not being considered. We know everyone needs some financial backing to support for the hours spent as well as take a project further you also need an efficient team.